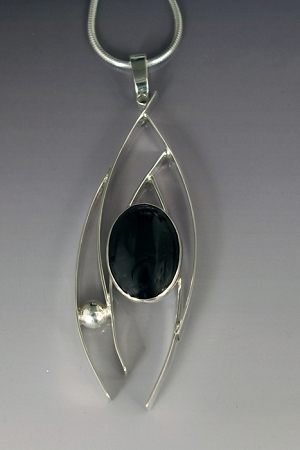 Classic Curves Jewelry - This handmade delicate sterling silver pendant features an oval black onyx cabochon. This One-of-a-Kind artistic necklace comes with an 18" sterling silver snake chain. Sterling silver classic design pendant from our "Wisps of Silver" collection. This delicate pendant comes with an oval black onyx cabochon and an 18" Sterling Silver snake chain. This necklace is signed and created by Aaron Rubinstein and Modern Art Jewelry.